What Does it Mean to Restore? To restore is a process of reuniting. It is an act that helps to bring back into existence, use, function or position a person, place or thing. Often it means to “return to life.” Similarly, to heal is an act to make someone or something whole. So, the process of healing is highly related to the process of restoring. Both seek to create unity. A practitioner of yoga explores connection to the many layers of their being including: their body, mind, breath, emotions, and energy. Deeply rooted in the practice is mindfulness, which is paying attention on purpose, without judgment but with compassion. Through this realization of our many layers of being, how they influence one another and our increasing acceptance of the moment, harmony is practiced. And it is a practice. There are good days and bad days, success and celebrations and losses and hardships. But they don’t have to make us any less whole. Life is always an ebb and flow. Change is always occurring. The criminal justice system claims to be a rehabilitative one. Implicit in calling it “rehabilitative” is the idea that it is supposed to help to restore the individuals who have made a mistake and were subjected to the penalty of law as a consequence of their actions. The Pennsylvania Department of Corrections mission is, in fact, to reduce criminogenic behaviors by providing individualized treatment and education to result in reintegration through accountability and positive change. Unfortunately, recidivism rates suggest that prisons don’t work. Within three years of release, about two-thirds of individuals who are released from prison will return. Clearly, the current method is ineffective. TYP is one of many organizations actively seeking to change the narrative of what are restorative practices within correctional facilitates and throughout the justice system. By providing trauma-sensitive yoga classes on the inside, we create an opportunity for individuals to find connection to their entire selves by exploring breath-centered movement and mindfulness activities. Our 200-hour Yoga Teacher Trainings (YTT) are a unique opportunity for individuals who are incarcerated to be able to gain a skill set that enables them to understand and integrate the philosophy of yoga into their own lives and to facilitate classes with their peers. I’d argue it is healing process. 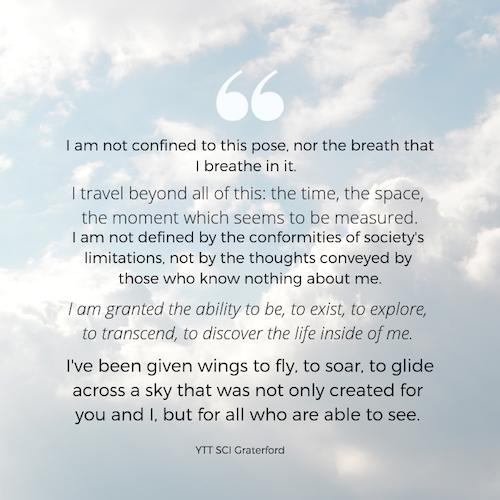 This poem was written by a graduate of our very first Yoga Teacher Training at State Correctional Institute - Graterford. He is now a co-facilitator of our current training at SCI - Phoenix. We like to think of our work in the lines of healing justice, transformative justice or even restorative justice. These frameworks believe in equality. They believe in people’s inherent goodness, recognizing that sometimes mistakes or bad things happen, but that does not make us any less whole or any less human. I wanted to share a little more information on each of these frameworks that envision justice to be that much more… more healing, more transformative, more restorative…. There is an adage - “Hurt people, hurt people. Healed people, heal others too.” Restorative justice seeks to break the cycle of violence by focusing on tools that help the individual heal and rehabilitate. It recognizes that although people often think of prisons as impenetrable, totally removed from us; the individuals who are incarcerated are still someone’s parent, grandparent, sibling, friend, spouse, leader, role model and so on. Even if there is physical separation, connection, and especially ideology, knows no boundaries. Restorative justice looks at the big picture of crime and sees it as a breakdown of society and human relationships. It then seeks to heal these broken relationships through conversation and community involvement and support. TYP practices restorative justice by creating an environment of respect, transparency and accountability. We invite people to discover how they can reunite what has been divided in their lives through the practice. Healing justice also seeks to create wholeness. But it does so by recognizing the impact intergenerational trauma and current structures of oppression had on creating rifts that cause disharmony. Healing justice seeks to reimagine the process of becoming whole through a generative and co-created future. Healing Justice recognizes that trauma, violence and oppression live on and through the body and can limit their experience, connection, and choice. Trauma-sensitive yoga is a way to become increasingly aware of the body and sensations and to also practice making supportive choices. Healing justice also allows for a place to practice care with each other that we each deserve. Yoga and mindfulness allow us an opportunity to develop and strengthen compassion self and for others. Transformative Justice is often seen as peacemaking. It is concerned with root causes of oppression by systems of dominance. It asks that everyone and everything change. We are all involved in a complex relationship that is currently disharmonious. Through connection and community building we can transform. A critical dialogue needs to be undertaken collectively about responsibility, accountability and initiatives to heal. As our name, Transformation Yoga Project, suggests, we believe that everyone is able to transform themselves. Because, our individual actions never happen in isolation how we personally transform, heal, or become whole can create a ripple effect. When this is done positively, it manifests change and transformation throughout. If you feel like you have learned something about healing and transformation, then please consider supporting our current Training to Transform Justice on Start Some Good. Your pledge will support 25 men in their own yoga journey, as they work to create connection and restoration in their own communities. We respect your privacy and do not share your information. We are a non-profit 501(c)(3) organization (EIN/Tax ID: 46-4589234). Your donations are fully tax-deductible to the extent allowable by law. We are a Gold Level GuideStar participant, demonstrating our commitment to transparency.